A full-colour leaflet for children with Bible passages, puzzles and questions looking at what happened at the very first Christmas. “The real Christmas cracker” is based on God's message to Joseph in Matthew 1 v 18-25. It looks at what really happened at the first Christmas, and what that shows us about who Jesus is and why He came. It is ideal for use in children’s groups, at holiday clubs or giving away at Christmas events. Suitable for use with ages 6-12. I found the booklet very relevant and child friendly. This is a basic gospel tract for children, tailored to Christmas. Simple format, nice design. 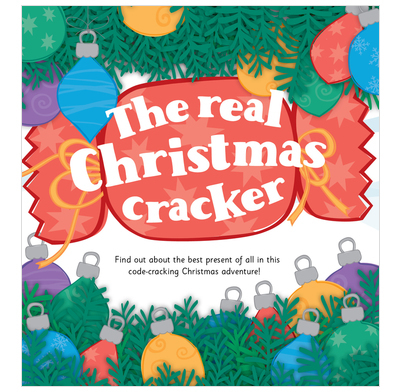 Fun code crackers for children. Questionable size of font: is this for kids to read or for their parents to read to them? Good value, quick delivery and service. Product was suitable for children at an outreach event. I bought a bundle of these to be handed out at a Nativity/evangelistic outreach event at our church. They were very well received by everyone, especially the chidren,who loved the "quiz" aspect of them.